Let's get a new quarter started! Would others prefer just one thread per year, starting in 2019? Thanks for the input! We'll see what others think and start off the new year with something different! Jean Faut on a 1995 Fritsch card, signed in blue ball point (also signed note), sent to her home on 9/11/18. Jean Havlish on a 1995 Fritsch card, signed in black ball point, sent to her home on 9/13/18. Joan Lequia-Barker on a 1995 Fritsch card, signed in black ball point, sent to her home on 9/14/18. Dorothy Kovalchick Roark sent her book ($25 & autographed) and included a signed thank you card, a signed Fritsch card she provided and a signed note!........ "Uncertain Destiny"
Katie Horstman on a 1996 Fritsch AAGPBL card (along with two signed notes), signed in black ball point, sent to her home on 9/18/18. Terry McKinley on a 1995 Fritsch AAGPBL card, signed in black sharpie, sent to her home on 9/14/18. Johnny O'Brien on a 1958 Topps card, signed in blue sharpie, sent to his home on 7/5/18. Jeanette Stocker-Bottazzi on a 1995 Fritsch AAGPBL card (also included a signed note), signed in fine black sharpie, sent to her home on 9/19/18. Hugh McElhenny on a 1958 Topps card ($15 fee), signed in blue sharpie, sent to his home on 9/24/18. Joyce Steele on a 1995 Fritsch AAGPBL card, signed in black ball point, sent to her home on 9/27/18. Sandy Wihtol on a 1980 Topps card (already had Larry Andersen on it), signed in blue sharpie, sent to his home on 9/7/18. Mamie Redman on a 1995 Fritsch AAGPBL card, signed in black sharpie, sent to her home on 9/15/18. Violet Schmidt-Weitzman on a 1995 Fritsch AAGPBL card, signed in blue ball point, sent to her home on 9/15/18. 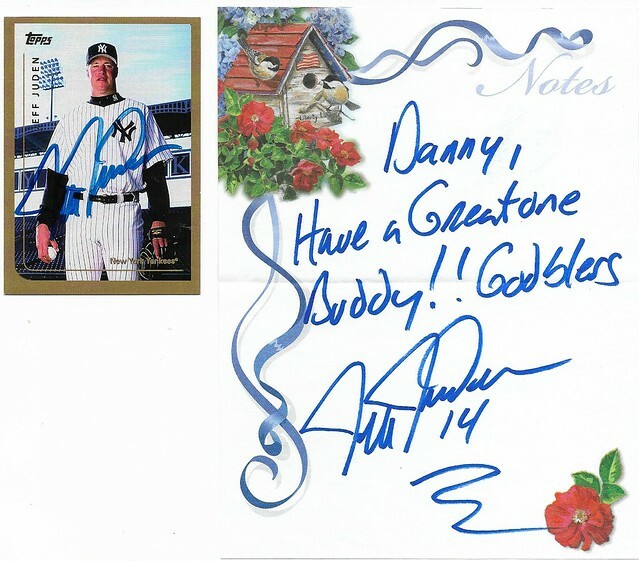 Jeff Juden on a 1999 Topps custom card (also sent a signed note), signed in blue sharpie, sent to his home on 9/11/18. Riley Kotil on a 1996 Fritsch AAGPBL card (she added a signed AAGPBL card), signed in fine black sharpie, sent to her home on 9/17/18. Helen Nicol-Fox on a 2002 Fritsch AAGPBL card, signed in fine black ball point, sent to her home on 9/17/18. 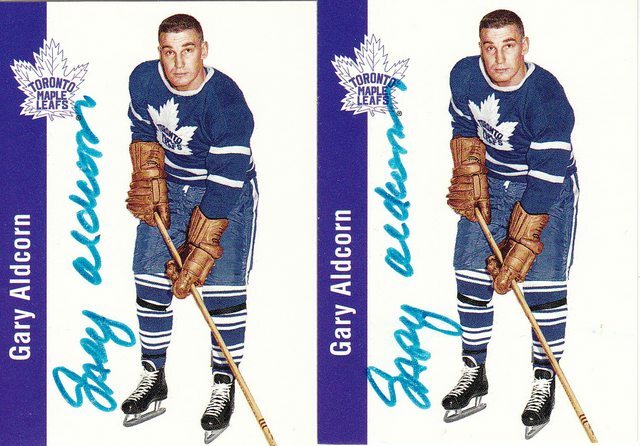 Chris Spurling 1/1 in 246 days and Allan Simpson 1/1 in 7 days. Both satisfying internet detective work. 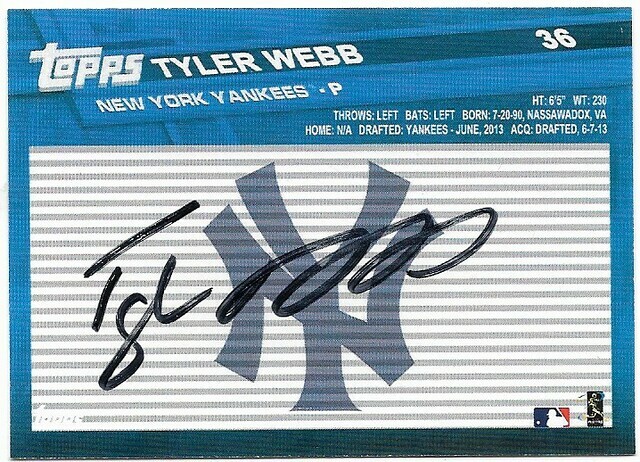 Tyler Webb on a 2017 Topps Custom card, signed in black sharpie, sent to the Cardinals on 9/10/18. Wander Javier on a 2016 Bowman card, signed in black sharpie, sent to the Elizabethton Twins on 6/27/18. Barbara Thompson on a 1995 Fritsch AAGPBL card, signed in black roller ball, sent to her home on 9/19/18. Marge Villa-Cryan on a 1995 Fritsch AAGPBL card, signed in black roller ball, sent to her home on 9/19/18. Nice getting stuff back after a few months of not sending stuff out.